And without further ado…here is my absolutely favorite part of this home. 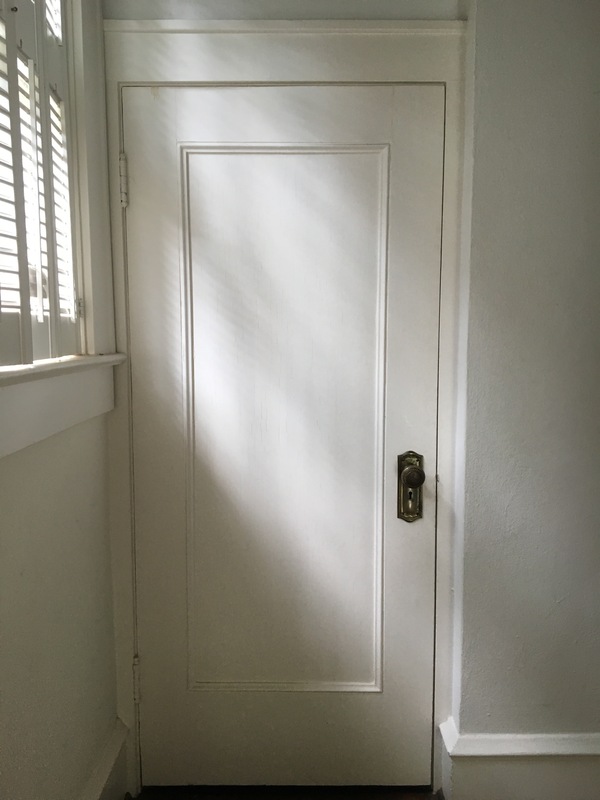 What could be behind this door located at the stair landing? And what could be behind these cabinet doors (furthest left floor to ceiling cabinets) in the kitchen too? We recently removed the door from the stair landing (and stored the door for safe keeping for reuse) to reveal the original back staircase. This small staircase leads directly into the kitchen. This is the view of the staircase from the kitchen up towards the staircase landing. This is what was behind the generic modern kitchen cabinet doors. Can you believe that! The past owners had closed off the back staircase and turned it into a makeshift pantry. 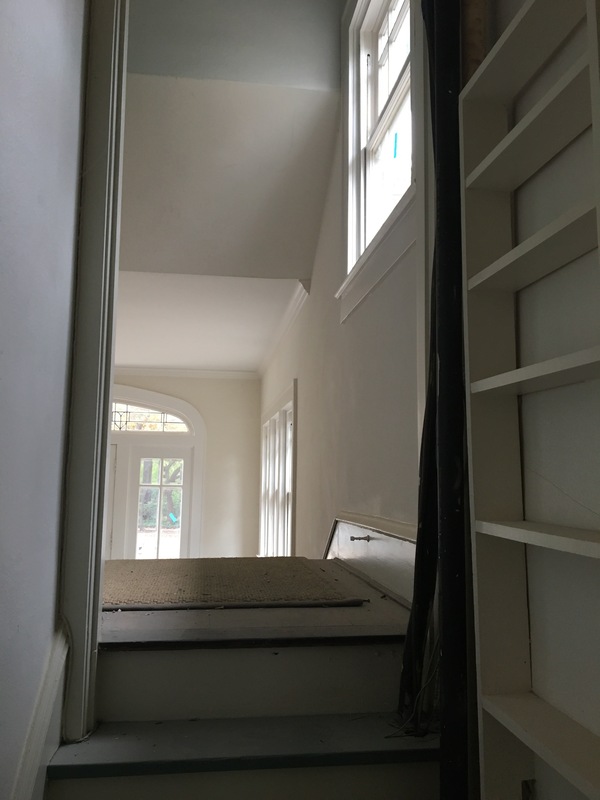 Here you can see the view from the pantry/old staircase to the staircase landing and towards the front entry. Here is the view from the top of the staircase down towards the landing. So, if you go to the right, you will go down the back stairs into the kitchen; if you go to the left, you will go into the front entry and out the front door. Here is the view from the stair landing down to the front entry. And here you can see the view down the back staircase (makeshift pantry) which leads into the kitchen. We are reopening the back staircase and removing the added pantry shelves. What a treat to have the option of coming downstairs in the morning and choosing which path to take, the one to the front of the home, or the one to the private back of the home. I will most likely chose the private back stairs. I just adore that it is one staircase split at the landing. There is something intimate and yet grand about this staircase. It is indeed my favorite part of this precious home. Here are the babies playing in the future playroom today. Precious little angels! Previous Post Images of the past. Next Post Stairs to here and stairs to there.